The following review originally appeared in the July, 2016, Bird Watcher's Digest. 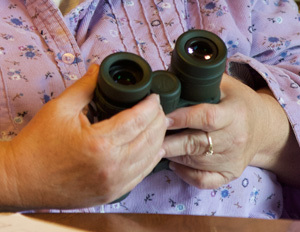 The first thing new birders need is binoculars. They need binoculars that will provide a good, clear, bright image. Just as importantly, those binoculars should be easy and comfortable to use. The trouble is that there are countless binoculars to choose among, with varying quality and enormously varying prices. Where to start? 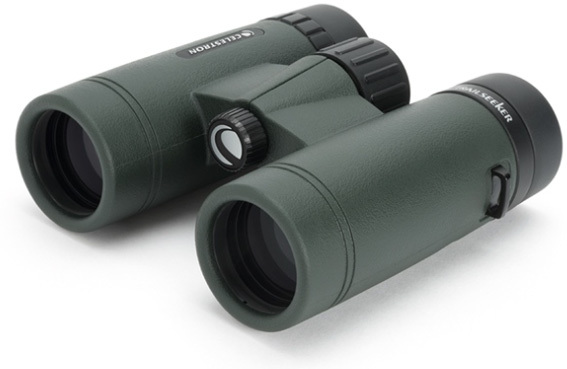 This review looks at some economical binoculars that are suitable for birders. Fortunately, over the last couple of decades binoculars have gotten better, and not necessarily more expensive. We were happy to find that a person can now own a very desirable binocular in the $200-$300 range. 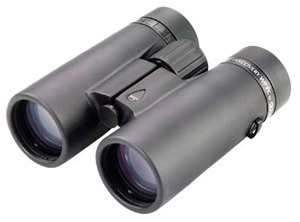 We looked only at 8x42 models, the most common choice for birders. We received 13 binoculars from 10 manufacturers. Each was roof prism design, had rubberized armoring, was waterproof and fog proof, had twist-out eyecups, and was tripod adaptable. These desirable features for birders seem at last to have become standard. We spent several weeks with the binoculars. We studied both their optical performance and their ergonomic factors. 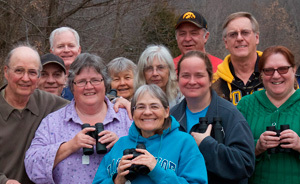 To include other points of view, and because everyone has unique hands and eyes, we invited a team of Iowa birders for a test day to help us in judging the binoculars. (Some of the judges are in the photo at right.) We incorporated the judges' findings into our evaluations. A chart summarizes our findings and shows the binoculars' specifications. Please don't take our results as absolutes. Binoculars are a personal choice. 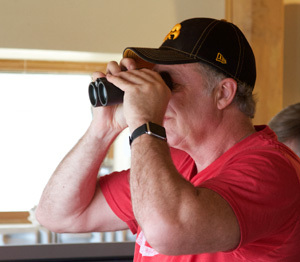 One of this article's aims is to describe some techniques that birders can use to evaluate binoculars for themselves. Hold the binoculars with both hands and look through them. Move the barrels together and apart until the two circles merge into one. If they won't merge, then the minimum distance between the two barrels is probably too wide for your eyes. For most people, all binoculars can be set to the correct distance. But not everyone. If you encounter this issue, ask a friend to measure the distance, center-to-center, between the pupils of your eyes, using a ruler with a millimeter scale. Then you can limit your search for a new binocular by looking at the specifications for the interpupillary distance (IPD). It's usually given as a range in millimeters, such as 55-77. Our chart has a column for IPD Range, but because it's not an issue for most people, we did not count it in the scores. While you're doing this test, notice how easy or hard it is to move the barrels together and apart. The hinge should be stiff enough to stay in place but not so stiff that you can't move it easily. You may need to re-adjust your binocular after handing it to a friend. Also, when looking at something very close, you'll squeeze the two barrels slightly together, because your eyes turn towards each other when converging on a close target. It should be easy to do. We tried the center hinge of each binocular. Most got a perfect score, but a few lost points for having hinges that our judges deemed too stiff. All the binoculars in our survey allow you to twist the eyecups in or out to customize the distance between the eyepieces and your eyes. Try this experiment. If you normally use eyeglasses, take them off. Twist the eyecups all the way in, to their shortest position, and hold the binocular away from your eyes. Aim at a bright area outdoors, or at a window. In the center of each eyepiece, you will see only a small circle of light. Gradually bring the binocular closer to your eyes. As you do, the bright circles enlarge until they fill the eyepieces. If you move the binocular even closer, you see black circles start to close in from the edges. The sweet spot where you can see the full image is called eye relief. It is the ideal distance between your eye and the lens of the eyepiece. That's where you want your binocular to be when it's steadied against your eyeglasses or the bony orbit around your eyes. Twist-out eyecups let you to set this distance so that you get to see the full image. Eye relief differs among binoculars. If you wear glasses, you need a binocular with long eye relief, because your glasses keep the binocular away from your eyes. Usually a person who wears glasses needs at least 16 millimeters of eye relief. Others do not require long eye relief. Faces differ, too. Everything interacts. Your facial structure, glasses style, the binocular's eye relief, and the eyecups' twist range all affect how well a binocular will work for you. Although binoculars manufacturers build in enough adjustability to work for almost everybody, you may not fit the mold. As a case in point, one of our judges who does not wear glasses had trouble with the especially long, 24 millimeter, eye relief of the Nikon Monarch 3. 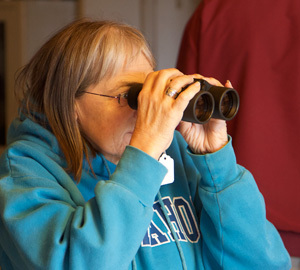 Even with the eyecups fully extended, she had to hold the binocular away from her face, thereby preventing her from stabilizing the binocular for a steady image. To be positive a binocular will work for your eyes, you need to try it. Eye relief is included in the chart, but because it's such an individual matter, it's not factored into the score. A prerequisite for using binoculars, let alone testing them, is to know what the diopter adjustment is and how to set it. The diopter adjustment allows you to set one of the eyepieces differently from the other, to compensate for differences between your two eyes. Once you have set the diopter adjustment, you don't have to set it again, unless it gets moved. For how to set the diopter, see here. 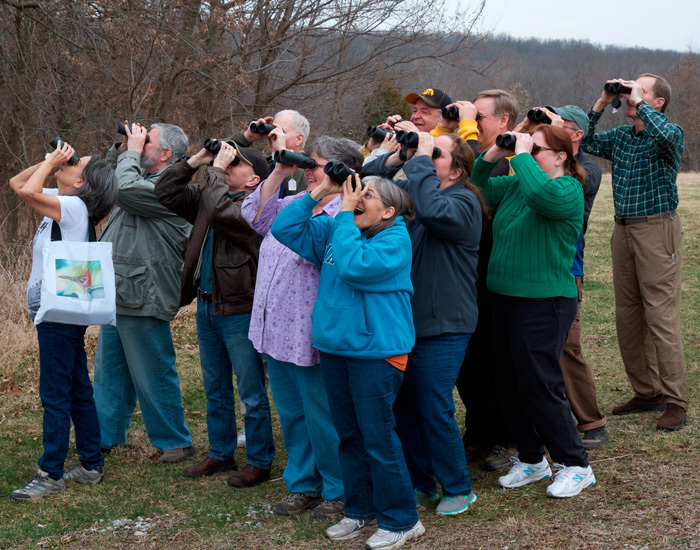 When we lead bird walks, a participant sometimes mentions that only one side of the binocular will focus. A quick look usually reveals that the diopter adjustment is set way off center. Although the best solution is to determine the ideal setting, simply putting it at the center position instantly makes the binocular work much better. All the binoculars in this survey have a diopter adjustment ring at the base of the right eyecup. Some kind of mark indicates the center or normal position, and that works pretty well for most people. The diopter adjustment should turn easily, because you have to focus with it in order to set it. On the other hand, it should be stiff enough not to get moved by mistake, or it should have a lock to preserve the setting. While locks are more likely to be found on more expensive binoculars, two of our survey binoculars have locks: the Olivon Osprey and the Eagle Optics Ranger. The diopter ring should have a scale, to let you note your setting and return to it if it gets changed. All these binoculars do have some kind of scale, but many are hard to see in poor light. You should be able to see at a glance if the setting is where it's supposed to be. The Vortex Diamondback and the Alpen Apex have easy-to-see marks of contrasting color at their center points. Excellent feature! We graded the diopter settings, with the top scores for binoculars with the right resistance, an easy way to find the center position, and perceptible scale or clicks to indicate increments. Lower scores went to binoculars whose diopter adjustments our judges found too stiff to turn with comfort, or whose markings were difficult to see in poor light. It's tricky to test the resolution of binoculars. You need to take care to insure objectivity. Here's what we do. Hold them really, really still. On top of a very sturdy tripod, we mounted a wooden platform. It's wide enough to rest two binoculars side by side on a beanbag. This lets us look without jiggling the image. Use the same target. To get a numeric score, we use a special, very expensive micro-printed resolution chart. We also use a US dollar bill, which has high-quality printing and lots of detail of varying sizes. If you don't have a chart handy, a plain old dollar bill will do. Use the same light, same distance, same color spectrum. The brighter the light, the better. We use a bright utility light so that the target is illuminated with the same wattage and color temperature each time. We set the tripod at the same, mid-range distance (22 feet, since that works with the room we test in). Test in still air. It makes a big difference. Just ask any photographer who uses long lenses. So we test indoors, where we can control the temperature and air. We turn off any fans, heaters, or AC in the room. Repeat, repeat, repeat. We test many times to rule out temporary changes in eyesight. Eyes get fatigued, and their acuity can change during the day. It's good to work with a partner. We both have to agree before we accept our conclusions. And we keep testing our eyes by checking the chart using a high-end, reference binocular. If we're getting consistent results with it, we know we're good. Cheat, and double the magnification. We made a special rig so we can align a doubler behind the eyepiece of the binocular and study the image at 16x instead of 8x. This gives us super eyesight and makes small differences in resolution more visible. Bottom line, you can't test resolution simply by walking into a store, picking up a couple of inexpensive binoculars and focusing on the sign on the far wall. However, if you want to compare binoculars at home, some of the above techniques may help. It's easier to spot the bird in foliage through a binocular with a wider field of view. And you get a better experience of immersion in the scene. The binoculars in our study varied a lot, with field of view at 1000 yards ranging from 324 feet to 426 feet. Field of view counted as part of the optics scores. Close focus helps when observing a bird at a feeder, watching hummingbirds up close, or observing butterflies. Generally today's binoculars allow closer minimum focusing distances than we saw a few years ago. 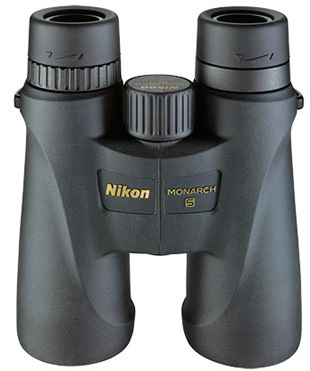 Our survey binoculars' close focus ranged from the Opticron Discovery, at 4.6 feet, to the Nikon Monarch 3, at 9.8 feet. How close you can focus depends not only on the binocular but also on the viewer's eye and focusing ability. It varies from person to person, so instead of using the manufacturer's specifications, we measured all the close focus distances using one person's eyes. Michael was the tester. We factored close focus into the optics scores. Here is where you are the expert. You are the ultimate judge on which binocular feels right to you. Below are some considerations to ponder when evaluating a binocular for yourself. Is this a weight you'll happily carry? 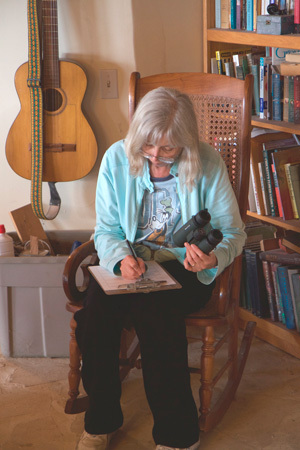 Generally, birders prefer a lighter binocular, but tolerance for weight is personal and individual. We gave points for lighter weights. Preferences vary and often seem to be affected by hand size. Hold a binocular yourself, and see how you like it. There was less than a one-inch difference between the shortest and the longest binoculars in our study. Generally our judges favored more compact binoculars, as being easier to pocket or pack. In scoring we slightly favored shorter binoculars, such as our shortest models, the Opticron Discovery, the Eschenbach Sektor D, and the Snypex Profinder HD, all of which are less than 5-1/2 inches long. The focus knob is your main interaction with a binocular. It's the control you use all the time. Feel the focus knob's resistance. Is it too stiff? It should feel smooth, consistent and precise, with no glitches. When you reverse direction, there shouldn't be slack. 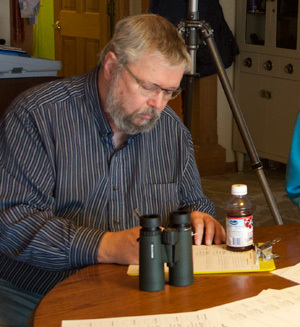 Our judges liked the focus knobs of most of the binoculars in our survey. Six of the 13 got a perfect score on the focus knob. Others turned less smoothly, or they were a little too tight for some of the judges. This is the most personal test of all. How does the binocular feel in your hands? Do you like the texture of the rubberized armoring? Do the strap lugs poke into your hand? How naturally does your index finger find the focus knob? We included the judges' opinions about hand fit and feel in the scores. We know that this measure is subjective and will not be the same for everyone. Our judges tended to agree on which binoculars had strap lugs that poked their hands. Binoculars that didn't do that got higher scores. If you're considering buying a binocular, it's worth noticing the manufacturer's warranty. Most offer a "lifetime warranty" against defects in materials or workmanship. What "lifetime" means is a little vague—the lifetime of the owner, or in some cases the lifetime of the binocular model. Since the warranty statements typically do not define their terms, we take it only to mean something like "a long time." Some manufacturers will repair or replace the binocular even if it is accidentally damaged, such as by being dropped. A warranty against accidents may last a specific time, or accidents may not be covered at all. Some warranties are transferable, while others expire the moment you sell or give away the binocular. Some require the owner to register the purchase with the manufacturer. Some require you to provide a receipt or other proof of purchase, and some require a fee when you request warranty service. See the chart for the warranties on these 13 binoculars. We did not factor the warranty into a binocular's scores. We made two summary sub scores for each binocular—one for optical quality and one for ergonomics. The average of those two scores yields the overall scores. We did not take into account the price, warranty, color or aesthetic appearance, eye relief, or interpupillary distance. However, those factors may well be important to your decision. We broke out the resolution scores in their own column. We mapped the scores so that 10 was the top score. Resolution was weighted the most heavily in computing the optics score. For ease of viewing online we have divided the charts into three sections. One shows the specifications, including field of view, close focus, eye relief, interpupillary distance range, weight, and length. The next shows the scores each binocular received in our tests, the prices, and for some a link to where to buy the binoculars. The third chart provides info about the warranties, whether they cover only manufacturer's defect or also covers accidental damage, whether they are transferable, whether registration or proof of purchase are required, and what fee if any is required. 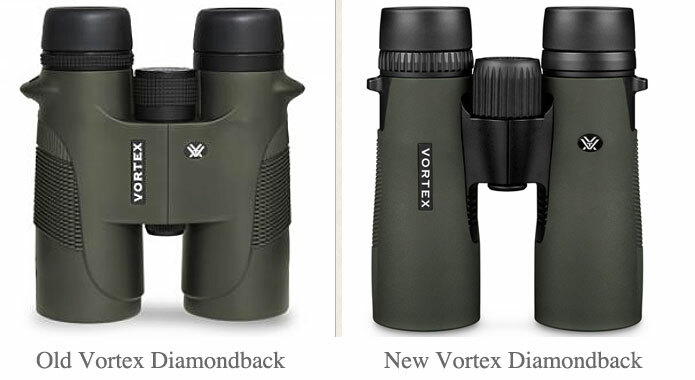 For years, the Vortex Diamondback has set a standard for good, economical, reliable binoculars in the low-medium price range. It felt like the Diamondback would be around forever. However, in 2016, without changing the name, Vortex came out with a completely redesigned version. We like it. Our judges liked it. It scored first in resolution, it earned high marks for ergonomics, and it won the top overall score. Notice the updated shape from the original Diamondback. The new version is streamlined, with a shorter bridge and more space along the barrels to wrap your fingers around. It's half an inch narrower, a fraction of an inch shorter, and nearly 4 ounces lighter than its predecessor. At only 21.8 ounces, it feels light and comfortable in the hand. The new Diamondback has a smaller minimum interpupillary distance, 55mm, than its predecessor, at 57mm. That won't matter to most people, but it puts the Diamondback in reach for a person with closer-set eyes. Your growing kid might be able to use it sooner. Dielectric coatings on the surfaces of the internal prisms improve the contrast, resolution, and color fidelity of the image. 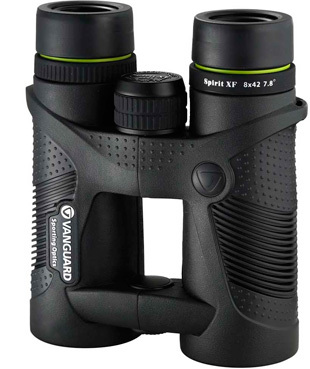 Previously, Vortex reserved this feature for its much more costly Viper HD and Razor HD binoculars. The new Diamondback does give up some of the field of view (now 393 feet at 1000 yards, vs. the old version's 420 feet at 1000 yards). However, it's still a good field of view. In our study, two binoculars matched the Diamondback's field of view and three exceeded it somewhat, while seven had significantly narrower fields of view. The focus knob feels precise, with no lag or backlash. It's a pleasure to operate. The armoring is agreeably textured and grippy. Most of our judges praised the Diamondback's comfort. The diopter adjustment ring is easy enough to turn but firm enough to hold. The center point has a conspicuous white mark. There's also something of a scale, though it is subtle and might be hard to see in poor light. The Opticron Discovery focuses closer than any other binocular in our survey: 4.9 feet. Wouldn't that be great for watching hummingbirds up close? Along with very good resolution and a good field of view (393 feet), that helped the Discovery be part of a three-way tie for second place in the overall score. It's compact for a 42mm binocular, only 5.2 inches long. Furthermore, it lets you fold its barrels closer together (53 millimeters) than any other binocular in our survey. If you need a binocular for a child as young as about age 7, or if you have trouble finding binoculars whose barrels will come together, this binocular could solve your problem. Several judges noted that they liked the easy, smooth, slack-free focus knob. One remarked that the Discovery "feels natural in the hand." The diopter adjustment ring offers the right degree of resistance. It's not easy to see the tiny raised dot indicating whether you're on the center position, but fine tactile clicks let you count how much you're moving it. We like this binocular a lot. You get a good feeling when you pick up an Alpen Apex, which is also in the three-way tie for second place. The Apex's very good resolution put it in the tight cluster that made up the top half of the resolution scores. The binocular seems solid, and yet it is among the lightest weight in the survey. Our judges liked its contoured shape. The strap lugs are molded into the armoring, shielding the web of the hand, for a comfortable grip. Details show a high level of engineering and manufacturing. The focus knob is perfectly smooth and consistent, with the ideal degree of resistance. The center hinge is just right. We love the eyecups. The click-stops, which allow four equally spaced positions, work with a positive, satisfying precision. At the center point of the diopter adjustment ring the Apex has a bright red mark, so you know at a glance if your diopter has been moved accidentally. Closely spaced indents let you determine an exact, repeatable setting. The knurled diopter adjustment ring is fully 2 cm. wide and easy to grip. Very nicely done. We like the close focus distance of 5.5 feet, but the field of view of 341 feet at 1000 yards is narrower than most of the binoculars in our study. The minimum interpupillary distance is 59 mm., which will not matter to most people, but it will be too wide for a person close-set eyes. On our tests, the Spirit XF was one of the binoculars whose resolution scores clustered in the top half of the entrants, and it also participates in the three-way tie for second place overall. The field of view of 409 feet at 1000 yards is exceptional and contributes to a viewing experience of immersion. This field of view beats everything else in the study except for the two Celestrons. Of concern only to a person with close-set eyes, the Spirit XF has a minimum interpupillary distance (IPD) of 58mm. Several of our judges remarked on its fast, easy, smooth focus. The eyecups allow for a choice of four positions. The strap lugs have a smooth, contoured shape that is courteous to the hand and does not poke. The rubberized armoring has more texture than most binoculars. Several of our judges remarked on the "friction grip" and how secure it felt to hold this binocular. The diopter adjustment offers the right amount of resistance. Raised marks serve as a scale, although these features are difficult to discern in poor light. The Monarch 5 binocular is a classic. It's been around for years and is a perennial favorite. Incorporating ED (extra-low dispersion) lenses and dielectric prism coatings, its bright, clear image earned the second highest resolution score in our tests. At 20.8 ounces, the Monarch 5 was the lightest binocular in the survey. The armoring has a pleasant texture. The contoured barrels are comfortable to grip, with gentle swells that keep the lugs from irritating the hand. The focus knob is so smooth and precise you could measure all other focus knobs in comparison to it. The eyecups snap precisely to your choice of four positions and should accommodate everyone, from people who wear no glasses to those whose glasses ride far from the eyes. On the diopter adjustment ring, indentations for the center are probably visible even in poor light. However, the adjustment ring is a bit stiff. Although the image is sharp, it is not wide. Its 330-foot field of view puts it in a tie for 11th place out of the 13 binoculars in our survey. Despite tying for the lowest street price of the 13 binoculars in our survey, the Celestron TrailSeeker ended up with an overall score in the top half. This binocular has a remarkably wide field of view—426 feet at 1000 yards. You feel you're right in the scene. The wider field of view also makes it easier to find the bird through the binocular. Only the Celestron Granite, from the same manufacturer, had such a wide field of view. Taken together with this binocular's low price and relatively light 23.1 ounces, we think this would be an excellent binocular for a beginner. It's a glorious age for affordable optics. 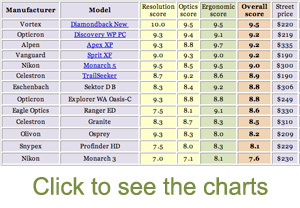 Take a look at the resolution scores on these inexpensive binoculars. To make these scores easy to understand in the chart, we mapped them on a scale from 7 to 10, with 10 being the best. Although resolution is only one factor in a binocular's image quality, it's pretty important. And one can measure it without fancy equipment. Now consider this. As we tested resolution, we kept checking our reference binocular, the new 8x42 Zeiss SF. When we map its resolution scores on the same scale, it got a 10.8. But it costs $2850. The Vortex Diamondback got a 10.0. It costs $220. There's never been a better time to start birding.